Daniel Latourette, a Film & Media Studies student, took this photo of a UR Baja SAE Team vehicle on the course at a recent competition in Indiana. 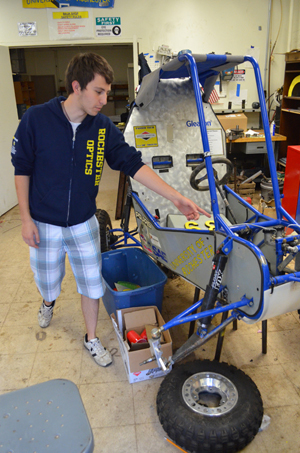 Below left, team president Nick Brown with the vehicle that will be readied for competition next spring. 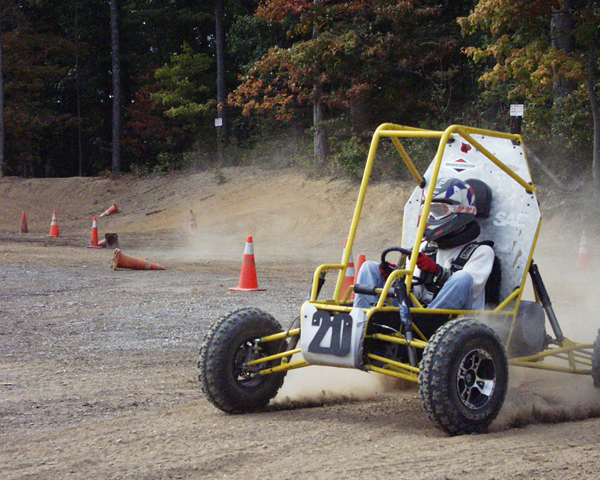 Oct. 8, 2013: New recruits for UR's Baja SAE team were quickly initiated this fall into the rigors of getting all-terrain vehicles ready for competition. Each year, the team designs, builds and tests a vehicle, then enters it against teams from other universities in sanctioned events in the spring. Two of the vehicles from prior years – one of them with its front end literally propped upon cinderblocks – had become something of an eyesore in the entry way at Hopeman Hall. Team President Nick Brown, a junior majoring in Optical Engineering, divided the new recruits into two teams. Each team was given one of the vehicles to repair and refurbish in time for Midnight Mayhem 5, an informal competition held last month at Charlestown, Ind., just across the river from the University of Louisville. New recruits spent several late nights in the shop in the week leading up to the competition. "I was really impressed with their dedication," said Adalberto Perez '15, a team veteran who helped supervise. "We actually modeled this project after the workshop model at UR," Brown said. "Instead of just lecturing them, we gave them a difficult and realistic problem and had our members help guide them through our thinking process. We've done projects similar to this in the past but never as exciting as giving them an actual car." Nineteen Baja members – 10 of them new recruits -- made the trip to Indiana, where the object was less about winning than gaining some valuable experience, Brown says. One of the cars, for example, needed more work than expected, and missed some of the events. "That team got the short end of the stick, but it was great for the recruits to see the vast difference between how competition goes when you're prepared versus not," Brown said. "Everything turned out fine, though, because both cars made it into the endurance race and everyone was able to have fun." "I was impressed with how seriously everyone who went took this," said Scott Russell, a senior technical associate with MechE, who accompanied the team. "Everyone was contributing something." The new recruits not only pitched in, but caught on quickly, Brown added. "By the final events, they were diagnosing and repairing problems with the car with minimal guidance." It was also good to see students interacting with teams from other universities and getting a chance to see other vehicles up close, Russell added. "Looking at other peoples' designs is interesting because it shows how different people, with a different library of knowledge, will approach and solve the same problem you're trying to," said Bill Green '16, the team's Usability Project Team Leader. "You can sit down for two days and not come up with much, then look at the way someone welded two parts together to make a lever, and think 'Wow, that was simple,' and then you have that approach in your own arsenal." Last year's Baja team members were still making final adjustments to their vehicle right up until departure for a competition; they had no opportunity to test it ahead out of time and encountered mechanical problems once the competition began. With even the new recruits learning that lesson already, the team is determined to have this year's vehicle finished well in advance. Students interested in participating on the team – and they can be from any discipline, not just engineering – can contact Brown at n.brown@rochester.edu. The team holds weekly meetings at 5 p.m. Fridays in Hopeman 224. Team members can usually be found working on their vehicle in the shop at the southwest corner of Gavett Hall between 10 a.m. and 4 p.m. on weekends.